« 4th birthday – Merry Go Round! 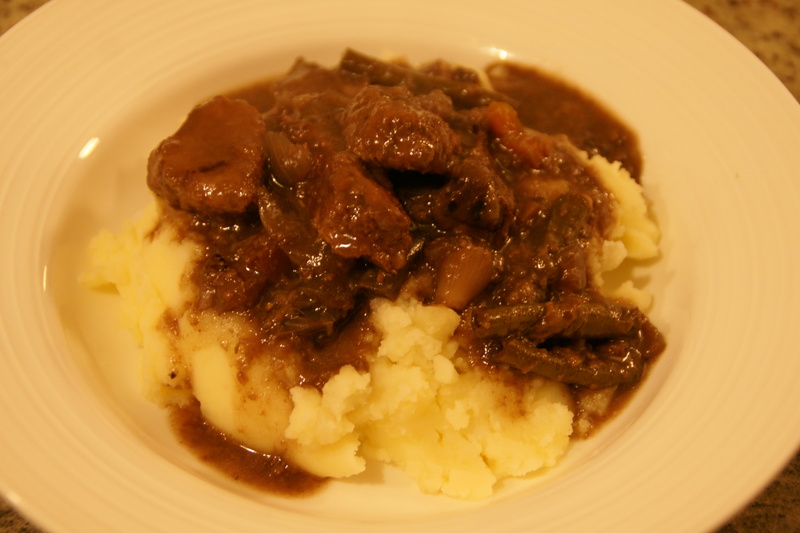 (Belated) Daring Cooks March 2012 Challenge – Brave the Braise! Traditional cooking methods may be classed as how heat is conducted through the food. First is moist heat (poaching, simmering, steaming or boiling) where heat is conducted through some sort of liquid; be it stock, sauces or steam. The second method is dry heat (roasting, baking, broiling, sautéing, pan frying) where heat is conducted by hot air, radiation or hot fat. Different methods are suited for different kinds of food. 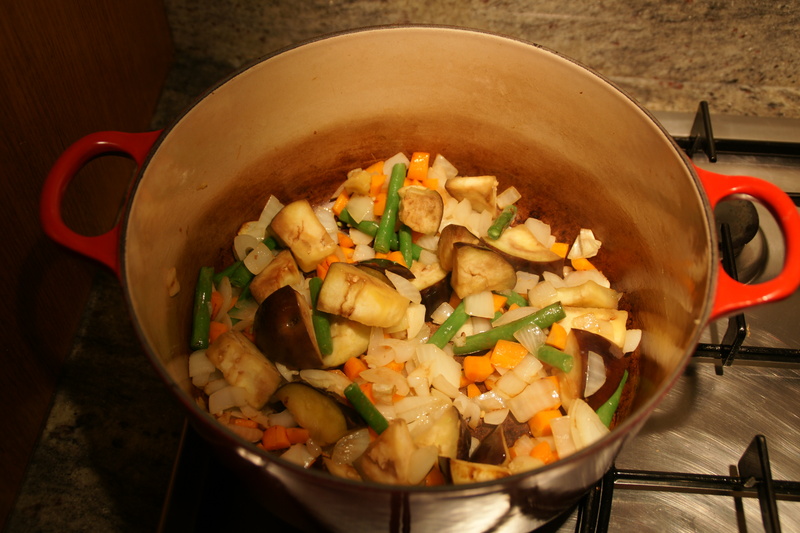 Braising, from the French “braiser”, offers us a combination cooking method – dry heat followed by moist heat. Typically, meat is seared in hot fat which helps to add flavor and aromas, improves color (browning), and texture (crust). It is then submerged in liquid and cooked slowly and gently at low heat. In a nut-shell that’s it! It should be noted that there are endless variations for braising including stove-top versus oven; partially submerged in liquid or completely submerged; or stews where there are many ingredients that are cut into smaller pieces. I was running late for this challenge, despite having given it quite a lot of thought. I often make large casseroles in winter and freeze them in dinner-sized portions. I’m not a huge fan of eating them myself, but they are easy and fairly versatile. I ended up trying this recipe from Jane and Jeremy Strode – http://www.smh.com.au/lifestyle/cuisine/meat/recipe/beef-braised-in-red-wine-20111018-1lwz6.html , based largely on the fact that I had half a bottle of red wine sitting around. If you read the recipe you will note that it calls for the meat to be marinaded in wine and spices for 2 days in 2 litres of wine, plus another 2 litres of wine to go in the braise. I don’t know about you, but I can think of other ways to use 4 litres of red wine. OK, maybe just one way to better use 4 litres of wine. Possibly not all at once, however. So I took the lazy person short cut and didn’t soak the meat, and only used the wine that I had. I also used less meat. And, since I grew up in a family where it was considered a sin to waste vegetables, I threw in some additional vegetables. In this case, cubes of eggplant and some green beans. Partly out of curiosity but mostly because that is what I had in the vegetable crisper. Despite my non-compliance with the recipe I think it worked out pretty well. The husband was happy, the 2 year old ate some and the 4 year old complained that it wasn’t spaghetti bolognaise, as she does for every meal which isn’t spaghetti bolognaise. 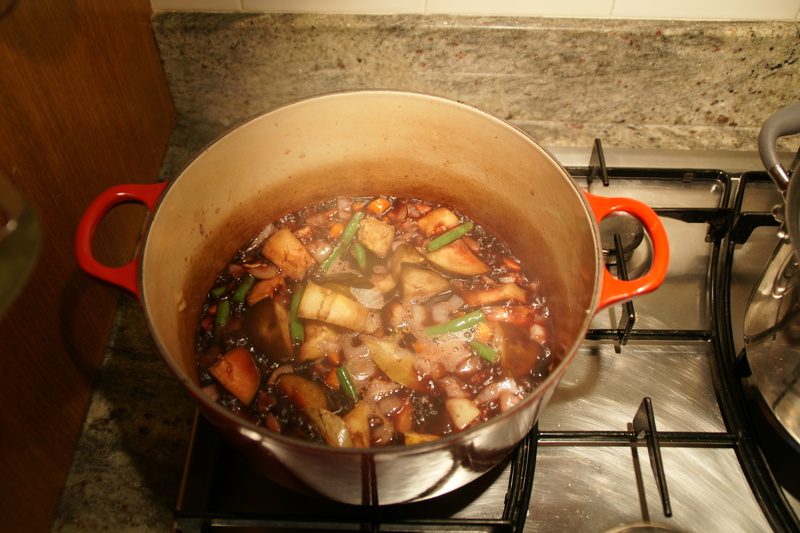 Braising has several advantages over other cooking methods in that it provides for uniform cooking when done in an oven with heat coming from all sides instead of just the bottom of the pan as well it requires less attention as it’s cooked at a slow and steady temperature for longer periods. Other advantages are that it clears the stove top for other preparations, the dish may be prepared in advance and the flavor improves over time! Better late than never and totally worth the wait 😀 it looks amazing!